...the solar battery charger for electric cars made by EEMCS’ Gautham Ram! 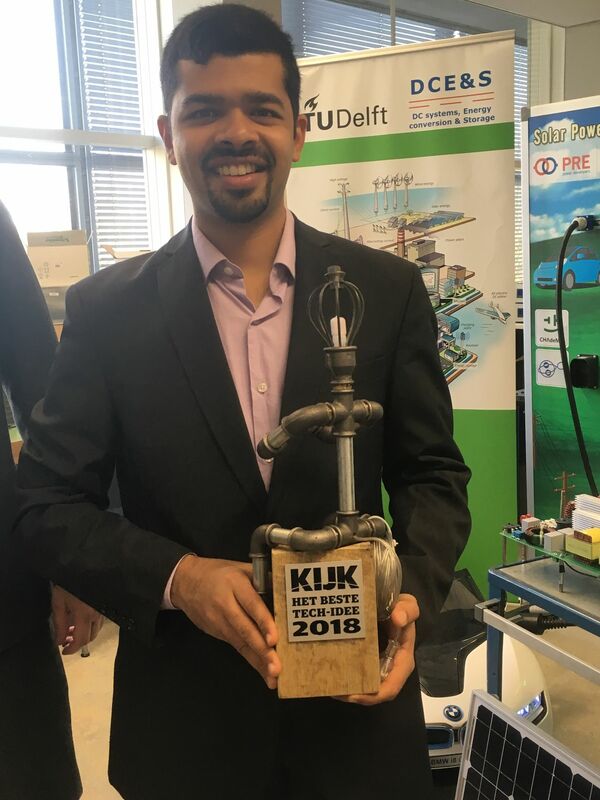 Both the jury of experts and the KIJK readers were enthusiastic about this idea developed at the Delft University of Technology to make electric driving truly sustainable. Electric vehicles are seen as the sustainable future of transport. But they are really only truly sustainable if the electricity to charge them comes from sustainable sources and not from fossil fuels. That is why companies and researchers are looking at, among other things, charging electric vehicles with solar panels. Together with Power Research Electronics (PRE) and others, a team of scientists from Delft University of Technology has developed a fast charger that allows electric cars to be charged directly using solar energy. The power grid is no longer needed as an intermediate step and the quick charger works in two directions. You can charge your electric car with solar power, but you can also use the energy from the car's battery to supply your home with electricity, for example. Professor Pavol Bauer and PhD student Gautham Ram Chandra Mouli worked together on the research of this technology.